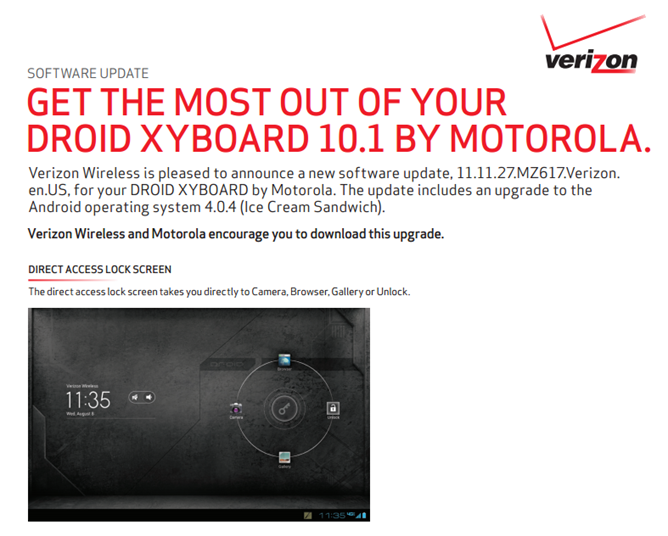 It was only a couple days ago that we heard the Ice Cream Sandwich update for the Motorola Xyboard Wi-Fi models would be rolling out. 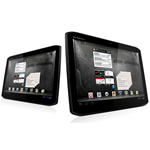 Now, Verizon has announced that the same update for the LTE version of the tablet is about to rollout to customers via an OTA upgrade. The package will be about 336.4 MB, so hope you're on Wi-Fi. Direct Access Lock Screen - The direct access lock screen takes you directly to Camera, Browser, Gallery or Unlock. Create Folders - Easily create folders by dropping one app on top of another. You can also add a name to specify the folder contents. Notification Bar - Enhanced notifications window includes access to settings menu, and the new swipe feature to dismiss individual notifications. All Apps Screen - Add Widgets and Apps to your homescreen panels via the All Apps Screen and the Widget Screen. Data Usage - Monitor your data usage all in one place. Set warning levels, check individual app usage or turn off data completely. Also, with this upgrade, your device will now run on Android 4.0.4 (Ice Cream Sandwich). + Includes the latest Motorola USB driver to allow Xyboard to connect to a computer to transfer files. + Securely refresh your Corporate Email account with the native email client. Check out the source link below for more info/screenshots. The rollout should be starting now, so go feverishly check for updates. I'll wait here while you do.